Happy almost Easter, everyone! Sorry we haven’t shared any spring-related recipes prior to this; we’re not very good about planning ahead so we generally do any holiday baking on, or the day before, the holiday. But we do have these to share, and they are quite possibly the cutest cupcakes ever (or at least the cutest we’ve ever made)! Really, they look absolutely nothing like real baby bluebirds, but you know what? They are way, way cuter! Our little brother who is seven particularly liked the adorableness factor, although he was too picky to go near the coconut. He tasted one toasted shred, made a face, and said to keep his plain… figures! We’re not going to lie, they did take a bit of time overall, but they are still very simple and doable for anyone who has even mediocre decorating skills. 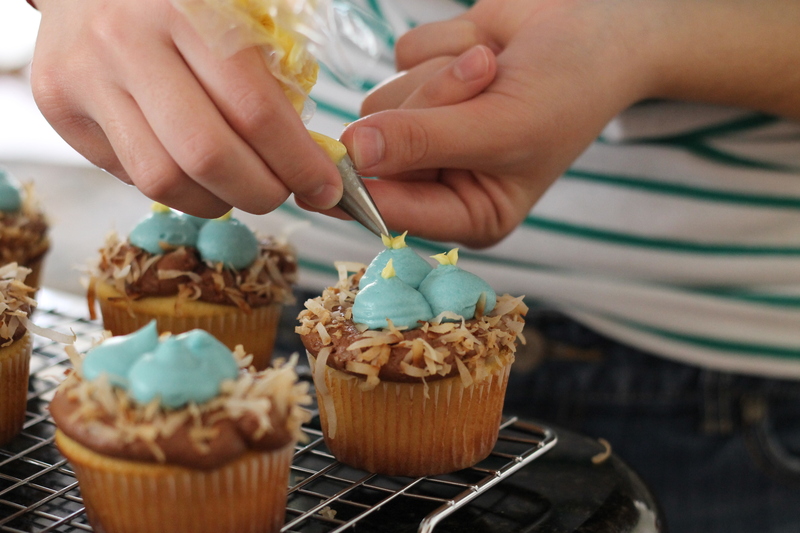 We recommend using a piping bag, not a ziploc bag, so that you have better control when piping on the beaks. That was definitely the trickiest part, and a ziploc bag is too floppy (as we learned the hard way after being too lazy to wash our reusable piping bag and running out of the disposable kind!). 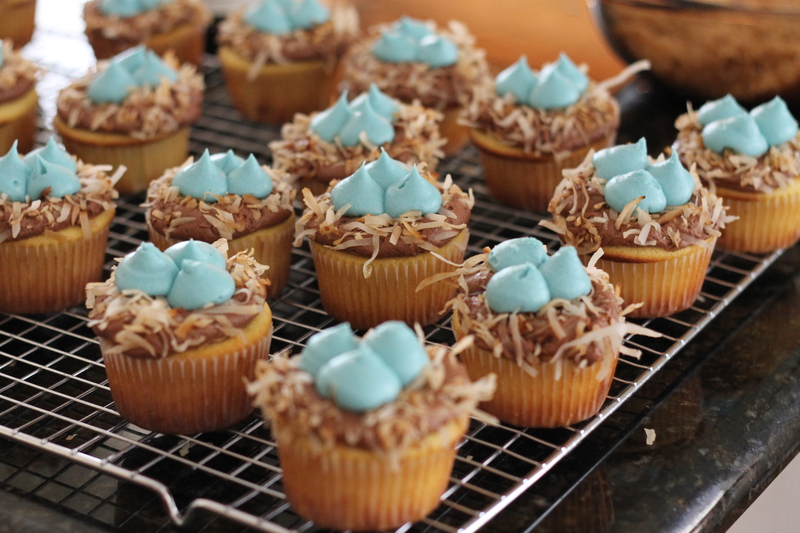 As for putting on the coconut, you can either dip the cupcakes into the coconut if your frosting is softer, or if it’s firmer, you can press on the coconut. Either method works well! Regardless, these are very fun and festive cupcakes! 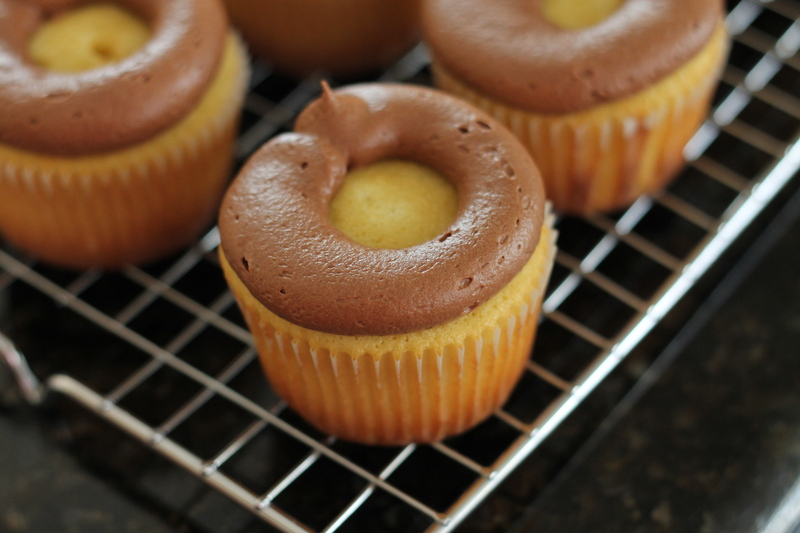 If your cupcakes are very rounded, level them with a small paring knife. Toast the shredded coconut (in the skillet or oven, it’s your choice, but the skillet is a bit easier) and let cool completely before continuing. Transfer to a bowl. 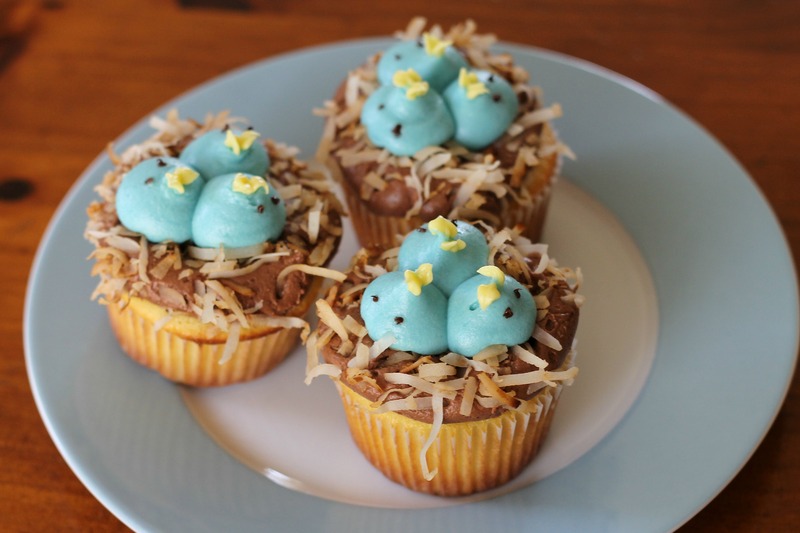 Using a pastry bag, pipe a ring of chocolate frosting around the outside edge of each cupcake to form the foundation of the nest. We used a large round tip. 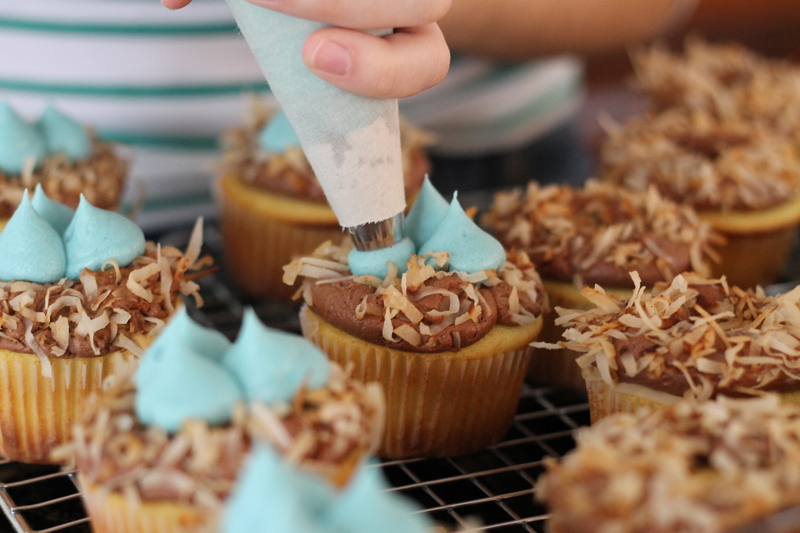 Coat the cupcakes in coconut, either sprinkling or dipping them. 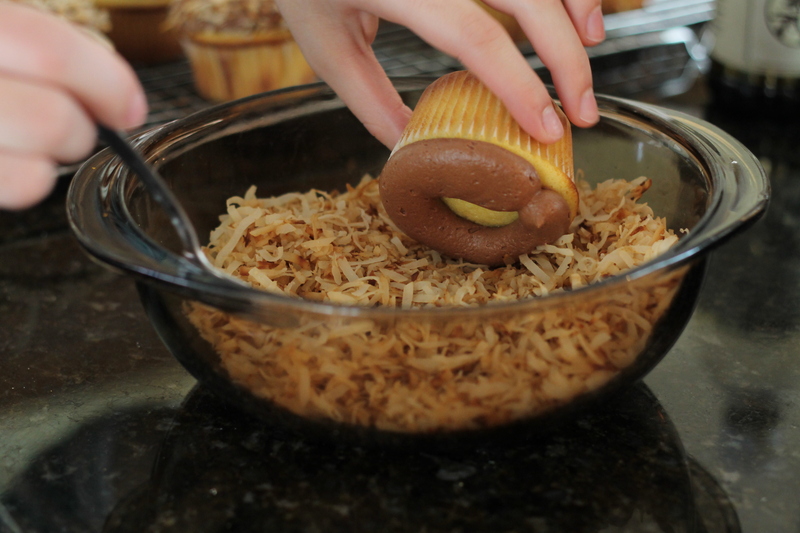 Gently press the coconut into the chocolate frosting. Shake off the excess. Color some of the vanilla frosting light blue. Using a pastry bag fitted with a wide round tip, pipe three mounds of frosting into the center of each nest to make the birds’ bodies. After the icing sets for a couple minutes, gently flatten any peaks with a toothpick. Color the remaining vanilla frosting yellow, and using a pastry bag fitted with a small “V” tip, pipe a beak onto each bird. Melt chocolate. Dip a toothpick in the chocolate and dot eyes onto each bird. Enjoy! Thank you! You know, we sort of felt the same way!